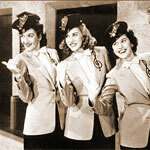 The Andrews Sisters was a musical variety show broadcast on ABC from 1944 to 1946. The three Andrews sisters were LaVerne, Maxene, and Patti who grew up and performed since childhood in Minneapolis. Besides their own program, they were also frequently heard on Fred Allen and Bing Crosby shows.